On April 4, UM-Flint School of Management alumna Teresa Lindhurst launched the alumni group – Entrepreneurs Society Affinity. 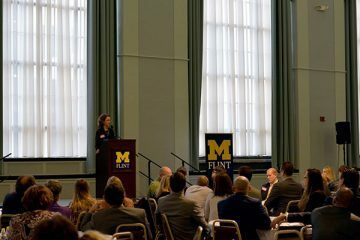 Held in the Northbank Center Grand Ballroom, guests of 150 included current School of Management students, alumni, and members of the Flint business community joined to celebrate the unveiling of the Entrepreneurs Society Affinity (ESA). The purpose of ESA is to create a dedicated network for supportive alumni and local business members who provide educational, mentoring, and employment opportunities for the students of the Entrepreneurs Society of the University of Michigan-Flint. Formed in partnership with the UM-Flint School of Management and the Flint and Genesee Chamber of Commerce, ESA Chairperson Lindhurst hopes to create a working relationship and community of ideas for the University of Michigan-Flint and local businesses. “We intend for students to work with companies, seek advice, gain critically needed experience, and provide excellent service to our regional employers. The University does a great job training our students, and the companies have growing needs for such employees. The Entrepreneurs Society Affinity is an organization designed to encourage people to work together to benefit our wonderful Flint community,” Lindhurst said. Teresa says Dr. Michael Witt, PharmD, JD, made the biggest impact on her UM-Flint career. As faculty supervisor for the Entrepreneurs Society, Witt first recruited Lindhurst, and, “the rest is history,” she says. With the Entrepreneurs Society, she says she was “working on real-world projects and meeting companies and employers in my field. It was through networking with the Entrepreneurs Society and Dr. Witt that I was able to get my job at PrintSites.” Together, Lindhurst and Witt have been laying the foundation for ESA. “When graduation came, I didn’t really want to leave it [ES] or the Flint area. I know there were many others who felt the same. There is life in this city, and we [ESA] want to be a part of its development,” says Lindhurst. The University of Michigan-Flint School of Management, the Entrepreneurs Society, the Flint and Genesee County Chamber of Commerce, and all others involved see a bright future for ESA and the opportunities it will provide to students.